Hello! As always, it's the last day of the month and I finally have my July Christmas Cards ready to post. As most of you already know, I play the Splitcoaststampers Christmas Card Challenge where we make Christmas Cards all year long so that were not stressed out during the busy holiday season. I make five cards a month so that I will have over fifty cards at the end of the year. I make long cards: 4 1/4 by 8 1/2 so that I can fit a Christmas Letter and a Photo Card inside. I also try to keep my layers to a minimum so that the cards are easier and more cost efficient to mail. For this month I made five identical cards using the retired Stampin Up! set 'Frosty'. I chose a snowflake designer paper from DCWV and simply stamped the snowman and the sentiment right on the designer paper. Then I stamped the snowman a second time on white card stock and colored in only his hat, scarf, nose, and buttons. I then cut only the main figure of the snowman out (not the hands , holly or snow). Then I adhered him to his stamped image on the designer paper. I colored the holiday directly on the designer paper (it was too small to cut out). I then took a hand punch and made a tiny red heart out of red card stock and adhered that above the letter 'I'. It was quick and simple, yet I think, adorable! Hello! Blue is one of my go- to colors whenever I need a peaceful or serene card. We recently had a woman at my church who's step daughter lost her very long battle with cancer. She was only a few years older than me, so it was a very sad occasion, but, expected. 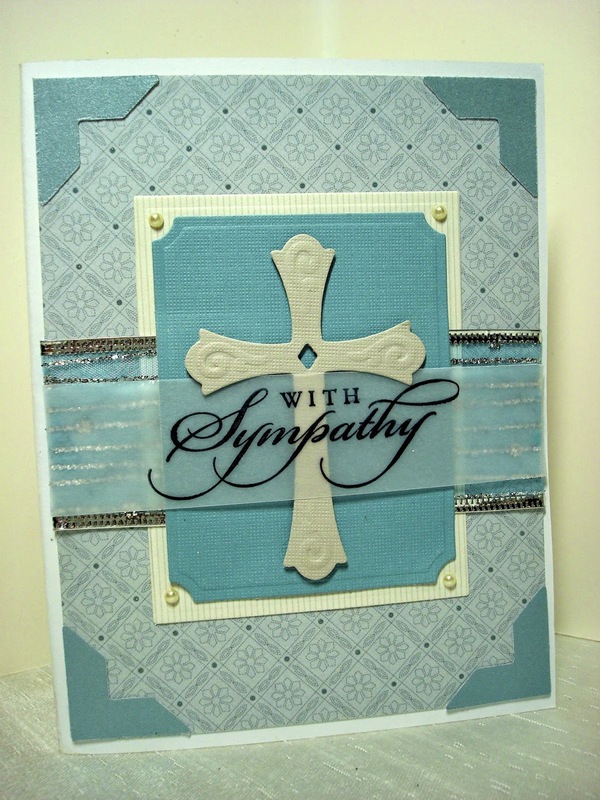 Because the mother and daughter were both Christians, I chose to do a Christian sympathy card and I used the color blue because I know the daughter finally had comfort from pain and peace of mind and spirit of where she is going. My main focal point on the card is the cross, which is a Spellbinder's Nestability. I have it mounted up on dimensionals. I used a corner rounder on the blue panel underneath the cross so I could add a few pearls. I put a strip of glittery silver ribbon in between the blue panel and the ivory designer paper. Everything was then mounted onto another piece of designer paper and then those corners were finished off with some metallic designer papers that I cut with a Sizzix die. I had a hard time figuring out where to put a sentiment on this card, so I ended up stamping it on vellum and then adhering the strip right over the cross. Hello! 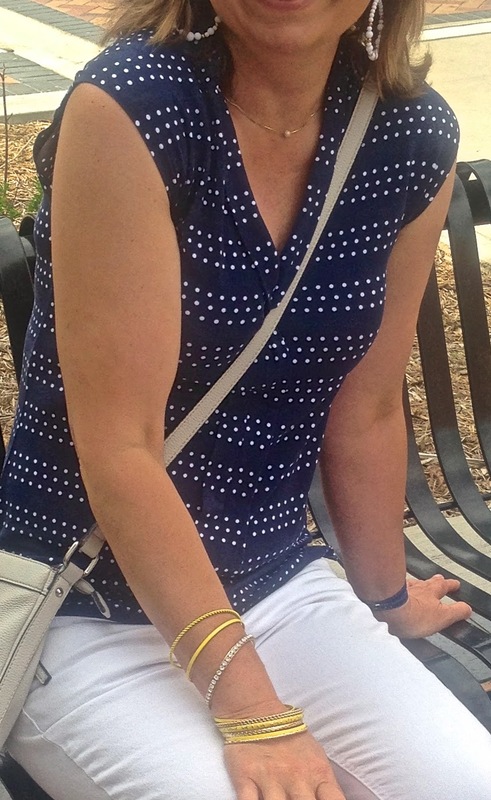 For this week's Fashion Over Fifty lets talk about what to wear in the summer when your over fifty and it's HOT outside. I recently had a conversation with a woman who is in her seventies, who said that she struggles with what to wear in the summer because she doesn't like to show her arms. Well, we all have some body part we like to hide no matter what our age, but the list of body parts we like to hide seems to get longer as we age! For me, I'm always trying to diminish the size of my upper arms, and hide my stomach. My legs, though thin, are covered with bruises and red marks, so I don't like to show those either; but I will if temperatures soar. My top summer essentials for staying cool, comfortable, and still 'hide' my imperfections, are knit dresses and maxi skirts. 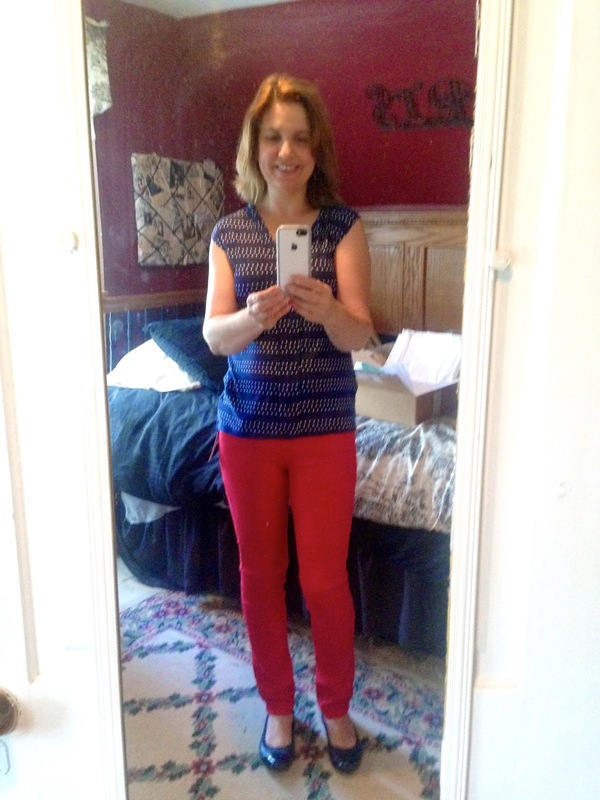 The outfit below I wore on the Fourth of July. I bought the dress last year from the Joe Fresh line sold at J. C. Penney. It is a sleeveless, knit jumper that is very cool and comfortable. 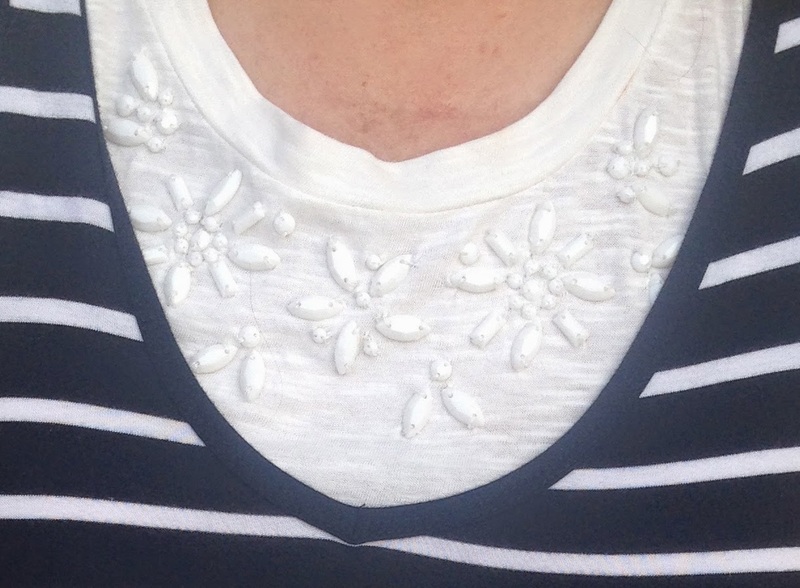 Because I like to hide my upper arms and it was too warm to wear a jacket, I wore a white jeweled tee shirt from Old Navy underneath. On other occasions, I have worn this same dress with a jean jacket, and on very hot days, with a tank top underneath. I love how it is totally fashionable to wear tennis shoes with dresses these days. You know me, I'm all about comfort: especially on my feet! 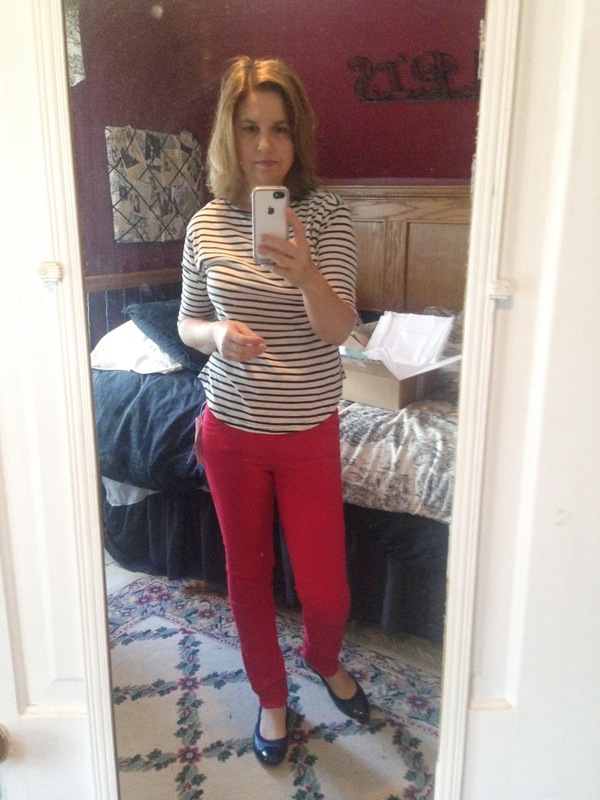 Because it was a patriotic holiday, I chose these Keds red tennis shoes (also from J.C. Penney) to wear, but I also love how they add a pop of color to an otherwise neutral ensemble. Even though the shoes have laces they slip on and off quite easily. The embellishments on the tee shirt are very subtle. They sparkle, but because they are white jewels, they blend in with the shirt. I like just the hint of glamour the jewels add to the tee. So what about you? What are your top summer essentials for staying cool and comfortable in hot weather? I'd love to hear from you! 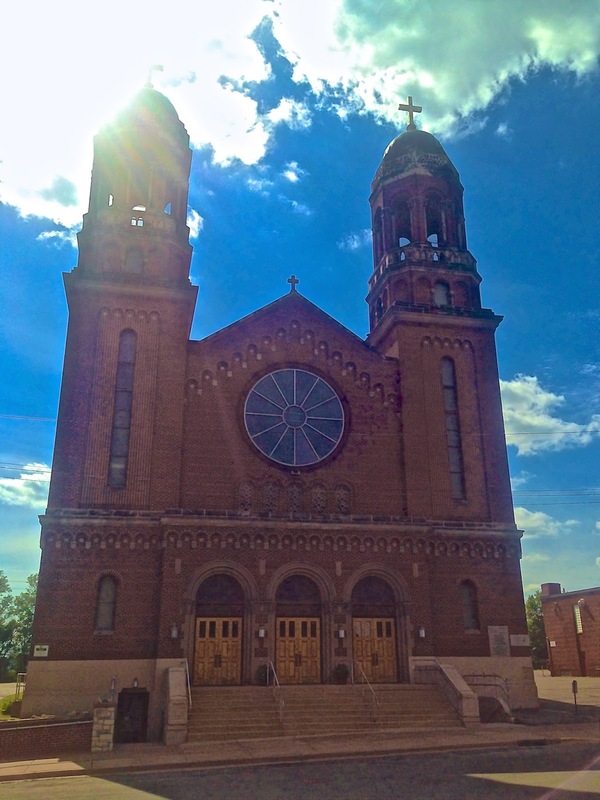 And if you love old churches like I do, here is a full picture of this beautiful Catholic church in downtown Eau Claire where these pictures were taken. GORGEOUS! Hello! I wanted to do a flower garden post today but I realized I deleted all my flower pictures from my computer. So I went to Instagram, thinking I could copy and paste them to my blog, but 'NO' apparently there is no way you can retrieve your own photos once posted to Instagram, because I tried and I tried and I can't get them back. Does anyone know of a trick I'm not aware of? In any case, if you are interested in what my garden looks like this year, you will have to check out Instagram because all the pictures are over there! So in place of a garden post, I decided to showcase my daughter's cards and talk about the unique creative process we all possess. 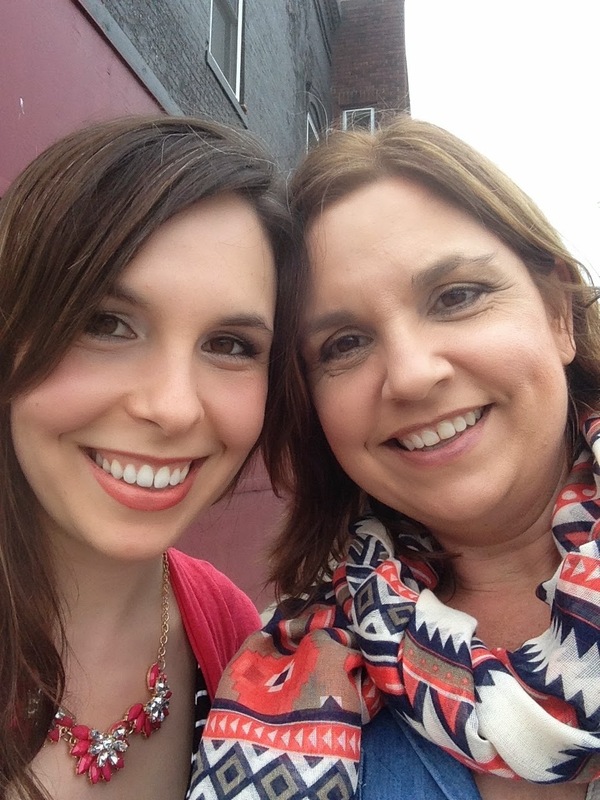 My daughter was visiting us back in June, and we always love to have some Mother/Daughter time in my craft room when she is home. While watching Ashley create, I noted how different her creative process was from my own. When I make a card, I first start with the occasion. What do I need the card for? Is it for a birthday, holiday, etc.? From there I usually go to my computer and search for either a sketch or a card to case from another designer. Then I proceed to make the card, and through the creative process, it usually ends up looking NOTHING like the original sketch or card I started to case; so, when I post it to my blog, I usually don't link it to the original artist for that reason. My card usually changes or evolves from the original inspiration piece because I have different images that don't quite fit the same, or different papers and embellies that give it a completely different look. My daughter on the hand, creates completely differently than myself. She starts with an occasion, like I do, but rather than search for an inspiration piece or sketch, she begins by searching through my multitude of papers to find something she likes or that she knows is the recipient's style. Because she loves to decoupage, she loves designer papers, and uses the papers as the main focal point of the card rather than a stamped image like I do. 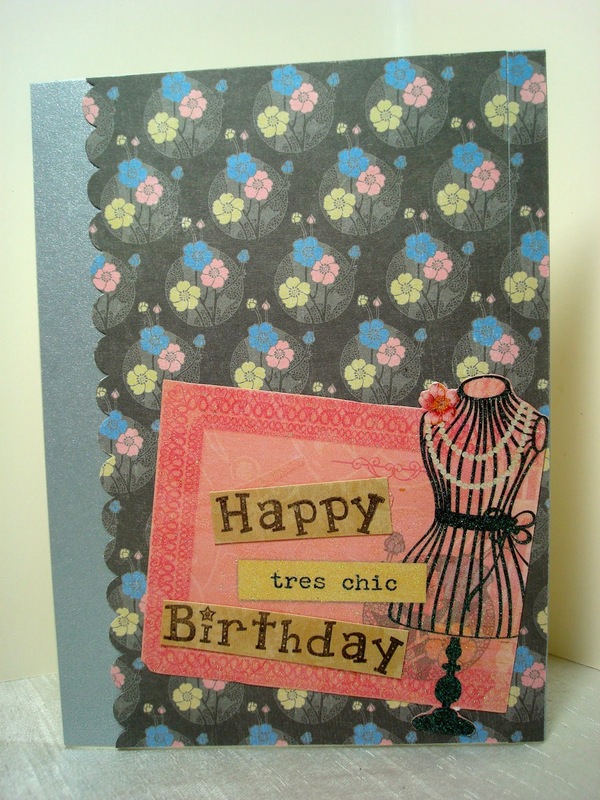 Here is a birthday card she made which uses only designer papers and a stamped sentiment. She added a simple piece of ribbon for embellishment. She made this anniversary card for her husband. The couple and sentiment are stamped, but everything else is just designer paper. The moon was cut out from a separate piece of designer paper and the clouds were made with a Cuttlebug embossing folder, some sponging, and an MFT cloud die. 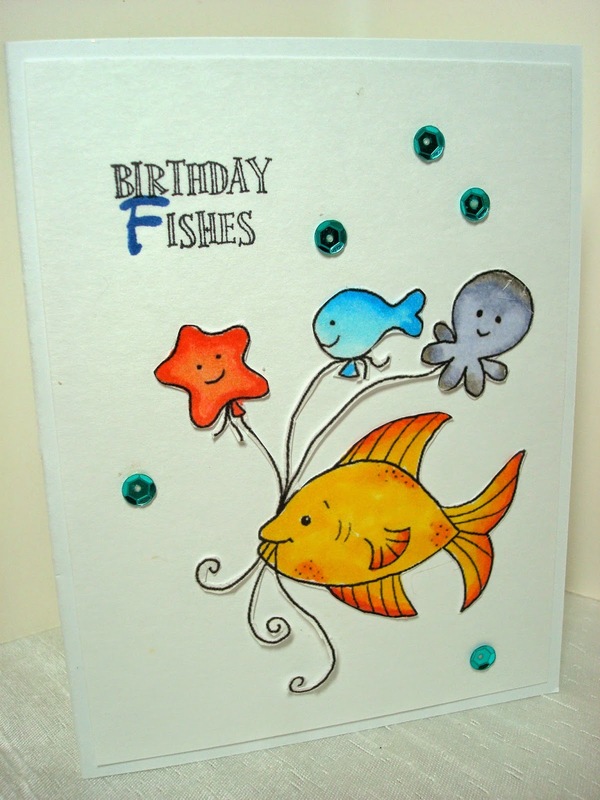 Everything on this card is also just designer paper except the two words 'Happy' and 'Birthday'. The Paris background is designer paper from DCWV. All Ashley did to create this beautiful card was add a die cut flourish from MFT and some flower die cuts. Ashley's style is much more vintage, romantic, and layered than my own clean and simple style. It's amazing how different we are as artists, yet, the same, because we are both creative in many different ways. 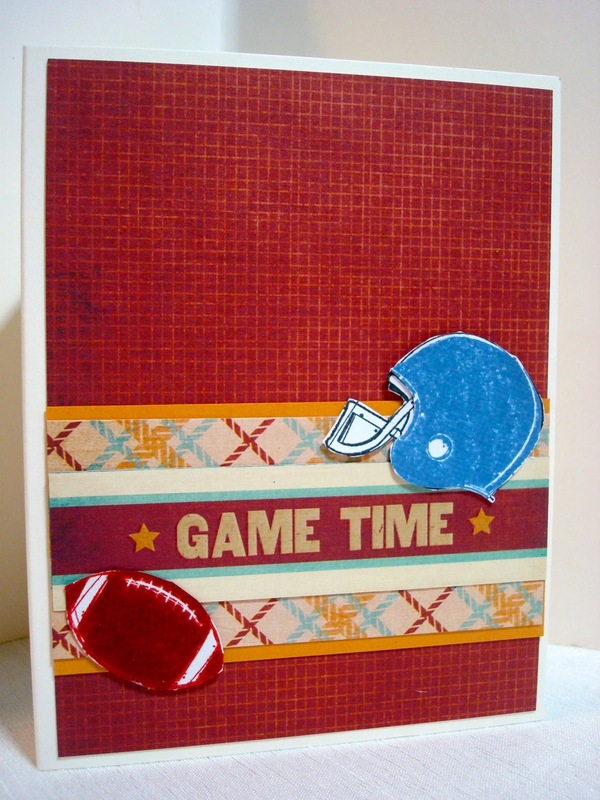 I kept the football helmet, but I got rid of the white space and added another layer of designer paper and a football. All the papers are from a masculine paper pad by DCWV. I cut the sentiment out of the same designer paper. The images are retired Stampin Up!. I popped the helmet up on dimensionals. It looks quite different than the original card doesn't it? They almost always do. So what about you? What is your creative process in paper crafting or any other hobby you do? Do you start with an inspiration piece like I do, or do you start with something you'd like to work with like my daughter does with designer paper? I'd love to hear from you! It might give me some new ideas! Take the Plunge & Make a Splash! Hello! Summer has finally made it to Wisconsin, it will be 90 degrees today! Yeah! And in honor of some hot temperatures, here is a warm weather card I made with my favorite Doodle Garden image. I just love this little girl. The water toy on her head is hilarious! To make my card I cut the image out after coloring and adhered here to the card base with dimensionals All the paper is old designer paper from my stash. I thought the sponged blue paper looked a lot like water or the sky, and I just added a strip of coordinating designer paper to match. I used my 'wave' Fiskars punch for a little border on the side, and a flower Nestability to make the sun. I added dew drops for embellishment to mimic water drops. The image was colored with Copic Markers. I gave her a little 'suntan' too! Hello! 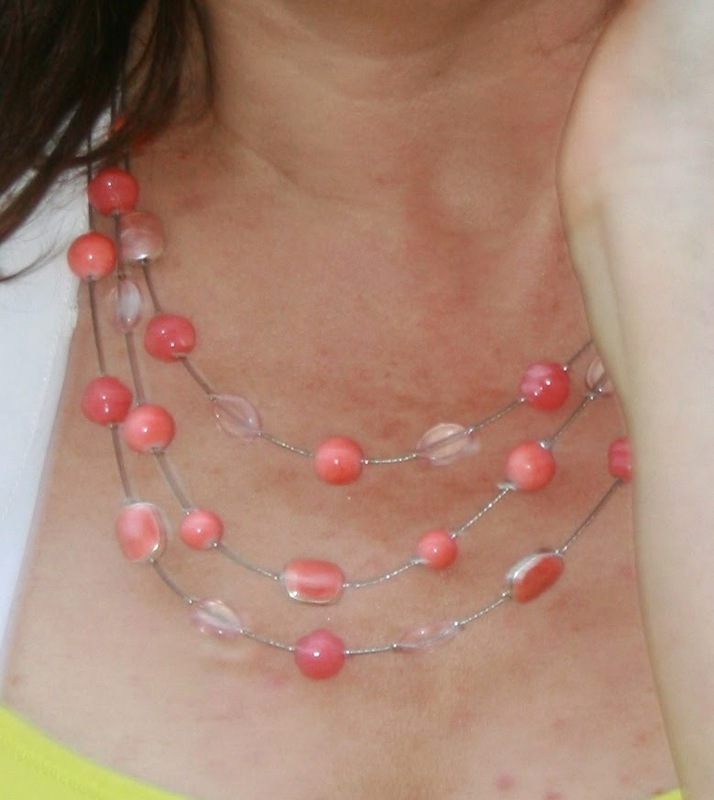 Do you like all the bright hot summer colors but fear they might look too trendy for you? Try wearing these new colors in classic clothes. 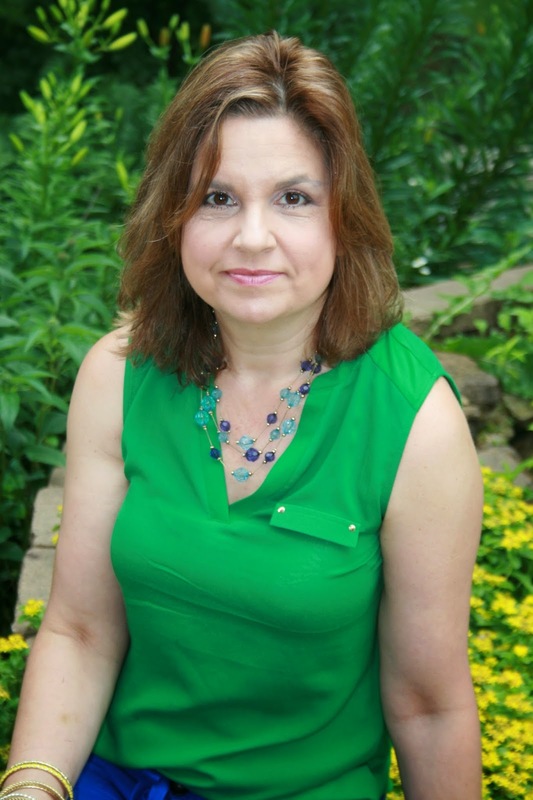 For this week's Fashion Over Fifty post I am wearing a pencil skirt and a sheer, white, button down blouse with a neon lime tank. The colors of the skirt and tank are very bright, but the clothes themselves are quite traditional which really balances the entire outfit. It allows me to be more on trend, yet, with a classic style for my age. Every item in my outfit this week was purchased last year. The skirt is from Target, the white shirt is from Express (but it is their classic Portofino shirt which they still sell), and the shoes are from DSW. I have many of these shirts in several different colors. I love the versatility of these shirts and use them often as a cover up. For example, this outfit I would wear with just the tank, but I carry the shirt with me to keep warm in air conditioned buildings and also to stay covered in social situations where a tank alone is not acceptable. 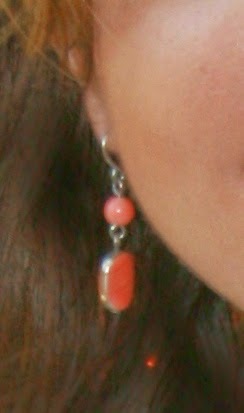 For jewelry I wore a coral multi strand necklace with coordinating drop earrings and a multi strand white seed bracelet. I bought these sandals last year. They are super comfy and because they have several different colors in them, I can wear them with many different outfits. First of all, 'no, I didn't get a divorce'. I'm still married to the same man I met over thirty years ago. But, I am dating again: my husband. 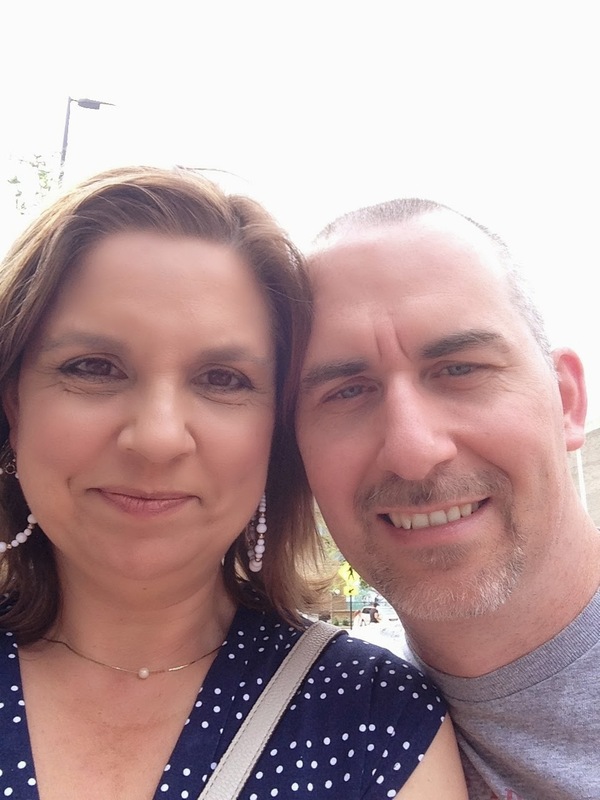 My husband and I are Empty Nester's and LOVING every minute of it. I know a lot of couples really struggle when the last kid leaves the nest, but for us it has brought us closer together and we've been having the time of our lives. We've been taking a ton of vacations, and having lots of date nights doing anything and everything we've always wanted to do but couldn't before because of the kids. Now, before you get all mad at me, lets back up a bit. We got married young, both still in college, and I got pregnant six weeks after we got married. We both still finished college and worked at the same time. After the baby came, life became an endless round of debt, more debt, constantly working to get out of debt, then we bought a hundred year old house, spent oh, a mere fifteen years fixing that up, then both my children decided to be musicians resulting in constant chauffeuring to only about five music lessons a week: piano, voice, drum, guitar, etc. not to mention the endless concert recitals, auditions, rehearsals, and all the huge financial costs those things incur; resulting in my husband and I never to have any time or money for us. Most couples, when they get married, have at least a few years to enjoy as a couple before the first baby comes. They not only use that time to get financially secure, buy their first home, and get their careers off the ground, but they also have that time to grow as a couple. We never really had that time because our first child arrived a little earlier than we planned. Now, I certainly have no regrets about my baby: she has been the absolute joy of my life, she is my best girl-friend (my husband is my best friend), and she is probably the most amazing human being I have ever known. I could not imagine life without her, and I thank God for the blessing He has given me in her every day. BUT, we did lose those years early in our marriage to bond as a couple because we had a baby. Now my 'baby' is married and living in another city and my other 'baby' is in his last year of college. My husband and I finally have some time to just be alone as a couple and enjoy each other; and you know what? We really, really love being alone again! I often feel guilty for it. I mean, what's wrong with me, all the other mothers usually cry their eyes out when the last kid leaves the nest? But, I don't feel lonely, I feel very fulfilled, very happy, and very blessed. In spite of the distance, I am still very close to both my children. Maybe, that's why I don't feel 'the empty nest', because we communicate constantly and still see each other often. I don't know, I only know I enjoy having the 'couple years' I never had early in our marriage, and it is wonderful. Now, how does one date after fifty? Well, pretty much the same way we dated when we were twenty: CHEAP. The irony is when my husband and I first met, we had no money because we were both in college, now we have a son who is in college and we pay 100% of his private tuition so that he will graduate debt free (unlike us), so, we still don't have much expendable income. Although we travel a lot, we travel cheaply. I use Hotels.com to get the best rates on hotels and accumulate free nights. We always travel by car, not by plane. We only eat out one meal a day, and stay at hotels with free breakfasts, having yogurts and fruit for a mid-day snack and eating an early dinner. And we try to find more inexpensive activities like state or national parks, walking tours, etc., so we don't have pay steep admission costs. However, money doesn't stop us from seeing something we really want to see. If we drove hundreds of mile to get somewhere, by golly, were going to see what we want to see! On our dates nights, we usually go to a movie, out for dinner, or just take a walk . We always check to see what is playing at the Budget Cinema first or we go to a matinee at a regular theatre. 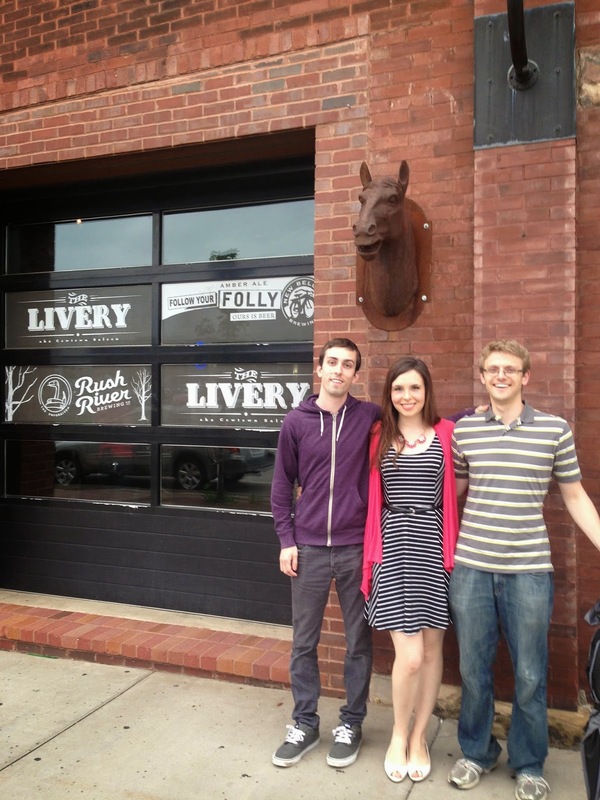 On our last date night, we did all three! Our budget cinema is located in beautiful downtown Eau Claire. Our city has really done a beautiful job in the past few years renovating the downtown area. Eau Claire is located on a river and has a gorgeous river walk and community area where concerts and a farmers market are held. There are many bridges crossing over the river for scenic views or fishing. It's a very deep and dangerous river, but people still tube on it (although I never would). Now to the most important part: WHAT DO I WEAR on date nights? Well, I like to dress up for a date with my husband just like I did before we were married. I want to look pretty for him, even though he would think I was pretty with no make up on and sweat pants, I still put some effort into my attire. I like to wear casual dressy clothes because most of the time I'm either wearing a uniform (my day job), or wearing really dressy clothes for church. The only time I get to wear my casual clothes is on a date, or shopping. 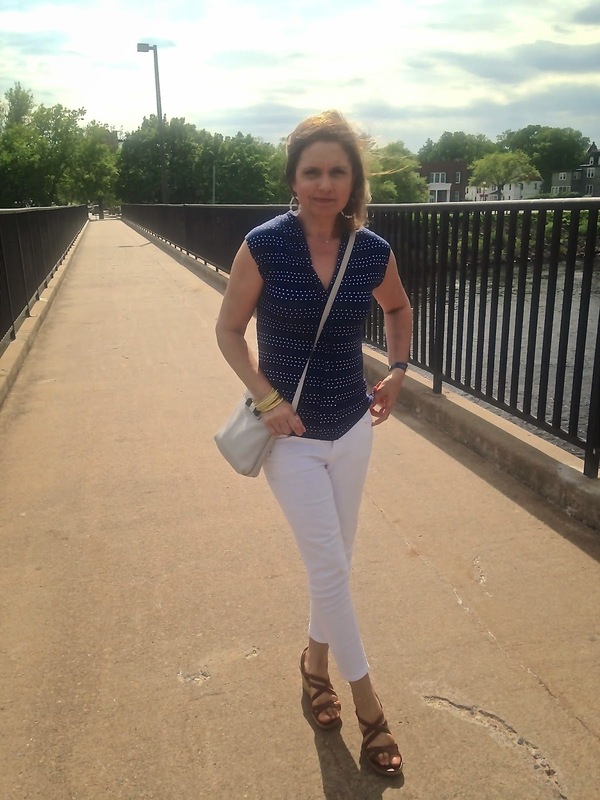 Here I am pictured on one of the many bridges overlooking the Eau Claire river. 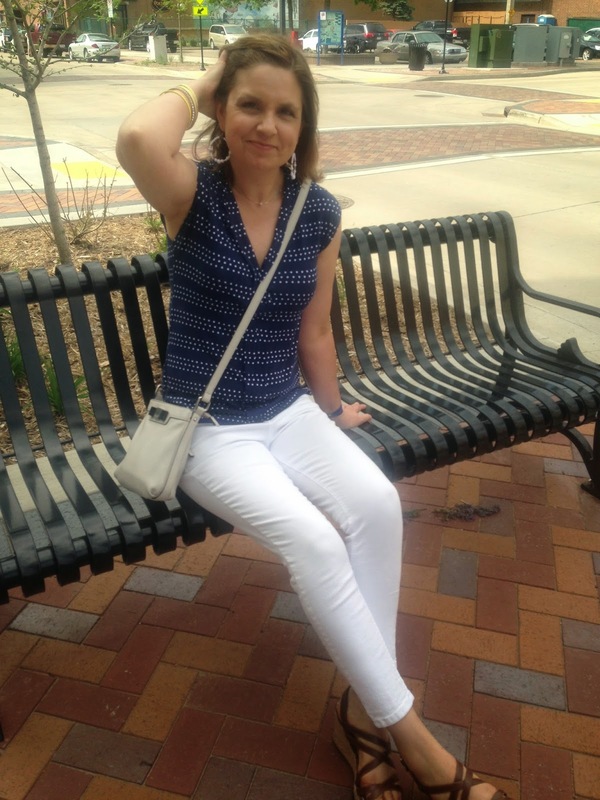 I am wearing white skinny jeans, and my blue and white polka dotted shirt from Stitch Fix. I turned what could have been a really casual outfit into a more dressy one by adding large hoop earrings, bracelets, and heels. On this date we saw a movie at the budget cinema, then we took a walk in our lovely downtown. We also had gyros at a local restaurant: yum! I bought the yellow and gold bracelets last year from J.C. Penney, and the sandals are from Famous Footwear and are several years old. 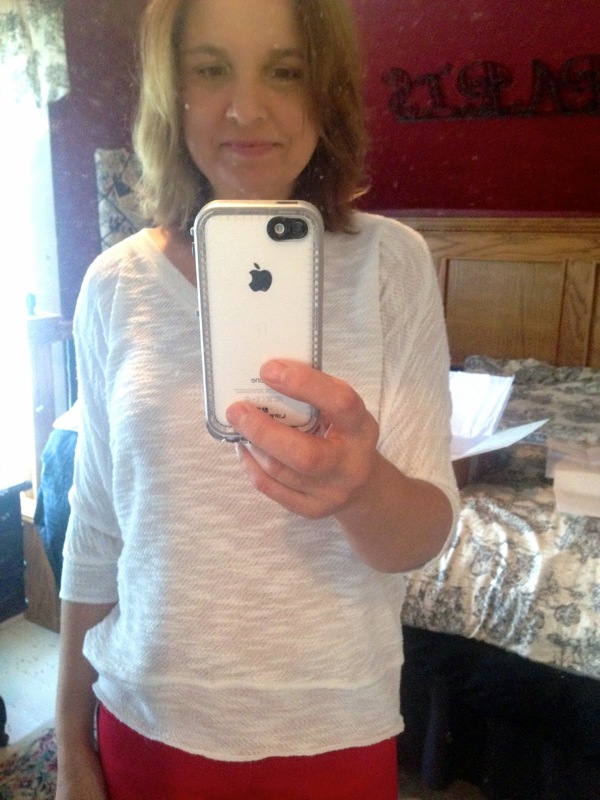 I think the only thing new I'm wearing is the Stitch Fix blouse. I finally joined the rest of the world and got a SmartPhone and took our very first 'selfie'. I also opened an Instagram account and I post a lot of fashion, garden, and just 'ordinary life' pics there that I don't post on my blog. Click HERE to follow me on Instagram. We had so much fun taking this picture because the phone was very new when this picture was taken and we had no idea HOW to take a selfie. We laughed our fool heads off when we found the little button that flips the image around to take a picture of ourselves. 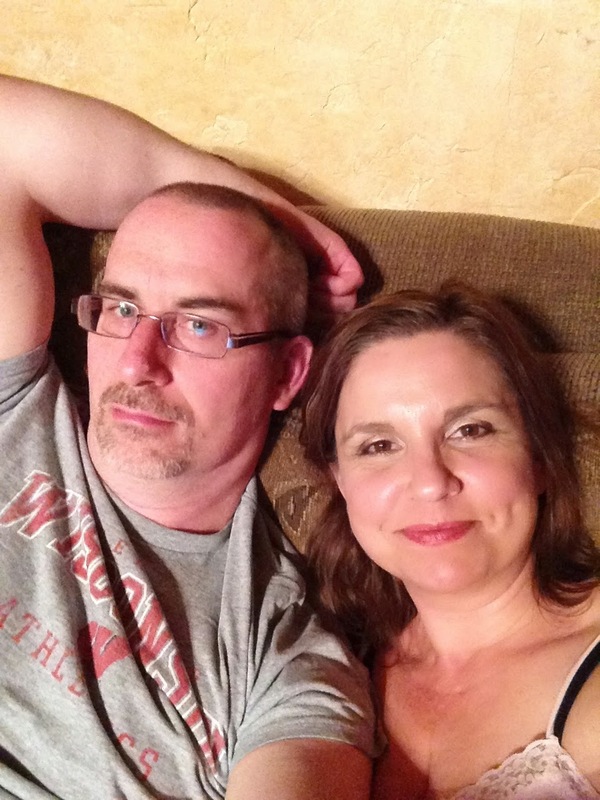 Even though we go out a lot and travel, my favorite thing to do with my hubby is cuddle on the chaise lounge: especially after a long hard day at work when I've been on my feet and walking all day! And in case you've never seen my beautiful baby girl before, here she is. Everyone always says we look a lot a like but I don't see the resemblance. I just think she is the most beautiful girl in the world, inside and out, and I don't even come close to resembling her. And finally, here is my daughter with my 'boys'. My son is on the left and my son-in-law is on the right. God blessed me double and gave me two great sons: one by birth and the other by marriage. My son is a very talented musician, is one of the most tender- hearted, loyal, and honest persons I have ever known, and he works endlessly hard striving for excellence in his craft. My son-in-law is a wonderful provider and husband for my daughter, is officially the smartest person I have ever known (he has a genius I.Q. ), has a wonderful sense of humor, and most importantly, a man who searches the word of God daily and seeks to always grow closer to Him. So, life after fifty is good. There is nothing to mourn, but only to rejoice. Rejoice in the blessings of a wonderful family. Rejoice in new time to get to know each other all over again. Rejoice in new opportunities to explore and learn. 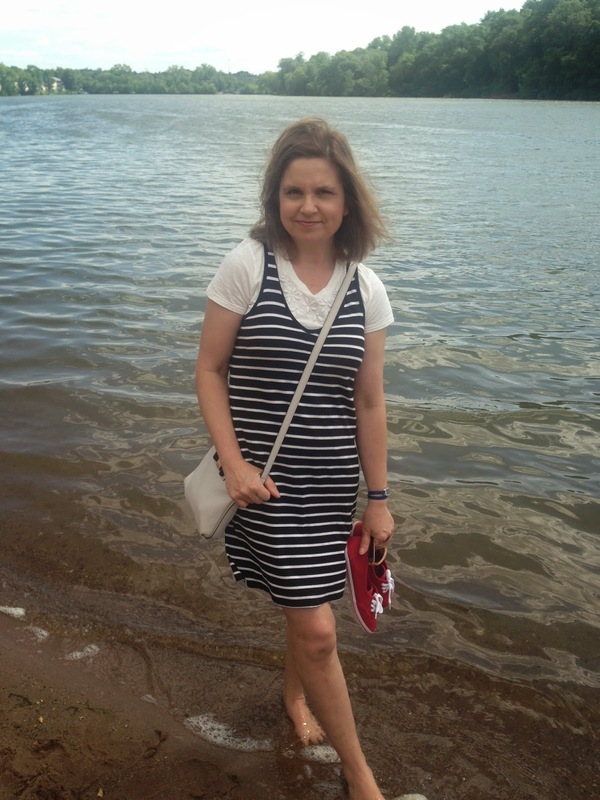 For me, being over fifty is a new beginning! And, I LOVE it! Hello! I have a cute, clean and simple card to show you today. I had this old digital image from 'Fred, she Said' already pre-colored in my stash, so I just cut it out and adhered it to a piece of plain white card stock. 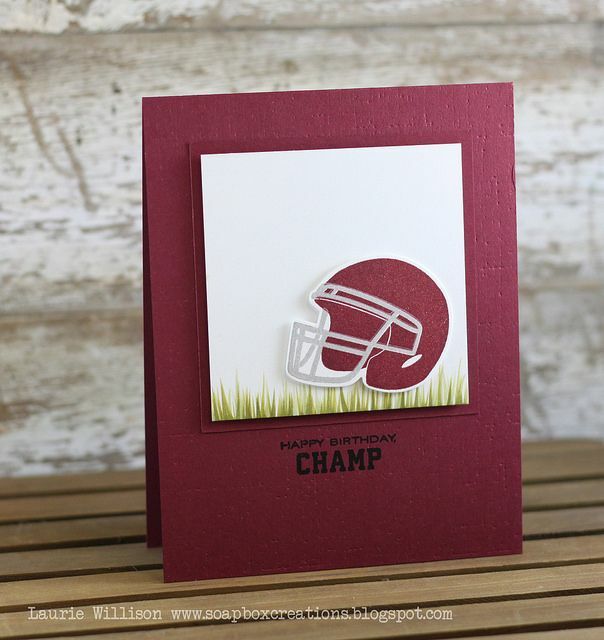 My sentiment is retired Stampin Up! 'Wishing Well'. I just masked over the 'W' with a piece of tape and used an 'F' alphabet stamp from another set to create my sentiment. The card was finished off with a few sequins. Hello! 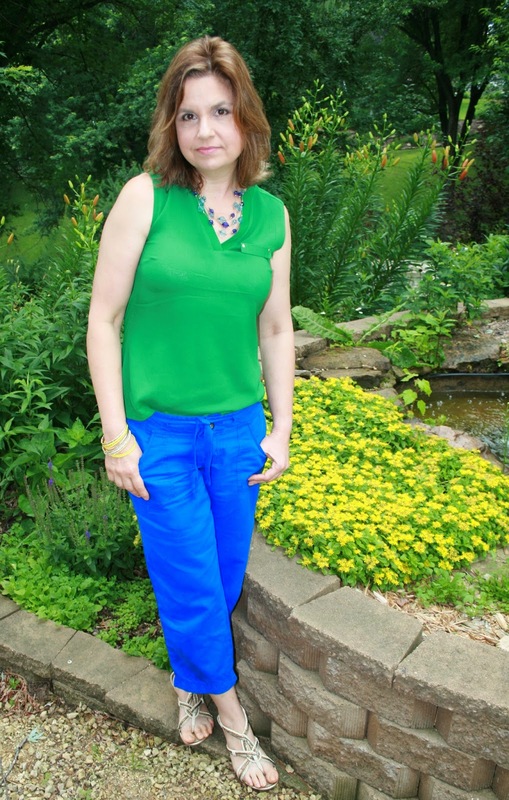 For this week's Fashion Over Fifty post I want to talk about playing with color. Now, I love color but my natural inclination is to usually pair it with a neutral like white, black, tan, or grey so that it's not so 'in your face'. I mean, I like to be noticed, but I don't want to stand out like a neon sign! So on a warm humid day this week, I pulled out this beautiful sleeveless shirt from The Limited to wear and I started to grab my favorite white jeans when I remembered the photo I saw on Pinterest (below right). Hmmm, maybe I should try another bold color for my bottom for a change, I thought. I then paired the shirt with soft cotton cropped pants from Express (very old, two seasons ago), and I really liked the look. I never would have thought of this color combo on my own, but it really works because the two colors are in the same bold hue. For example, I don't think I could wear this shirt with pastel pink pants. 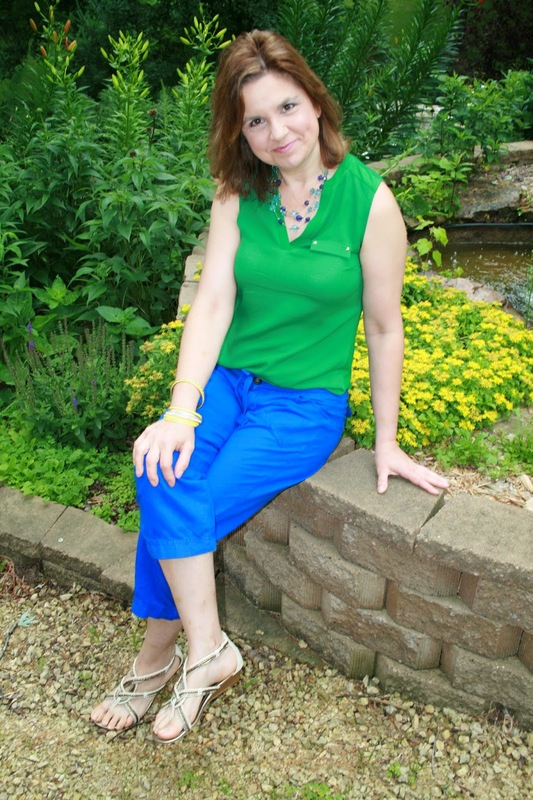 For jewelry, I pulled another bold accent color into the ensemble by adding these neon yellow and gold bracelets. I completed the outfit with a blue beaded multi strand necklace and some neutral sandals that also have some metallic gold in them. How about you? 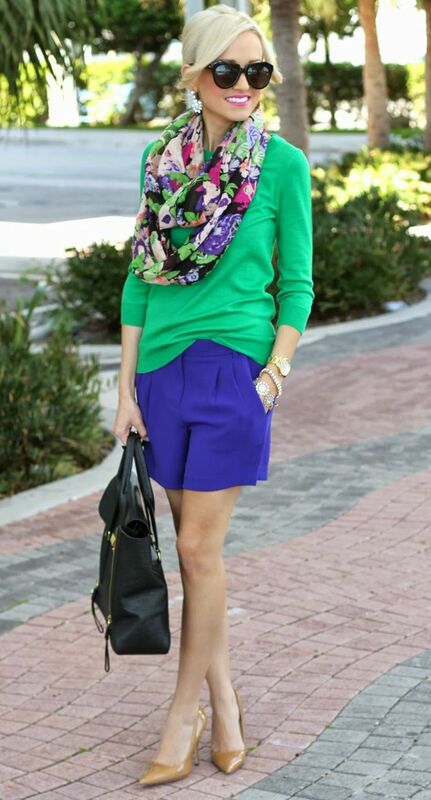 How bold are you when it comes to making color choices for your wardrobe? Hello! 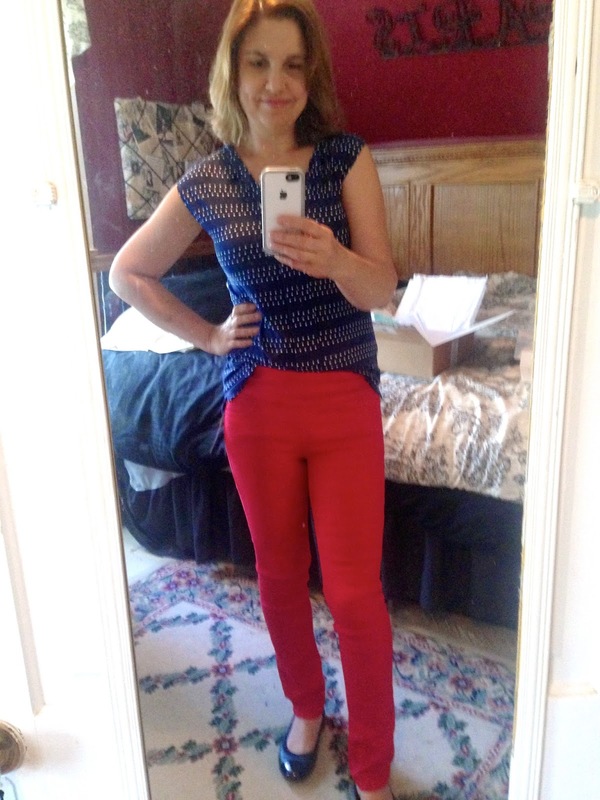 I received my latest Stitch Fix yesterday and I am so excited to share it with you because it was MY BEST FIX EVER! As most of you already know I do Stitch Fix about three or four times a year to keep me from getting in a style rut. I've been getting fixes for over a year now, and I only had to send one item back out of all the items I received (because it didn't fit). 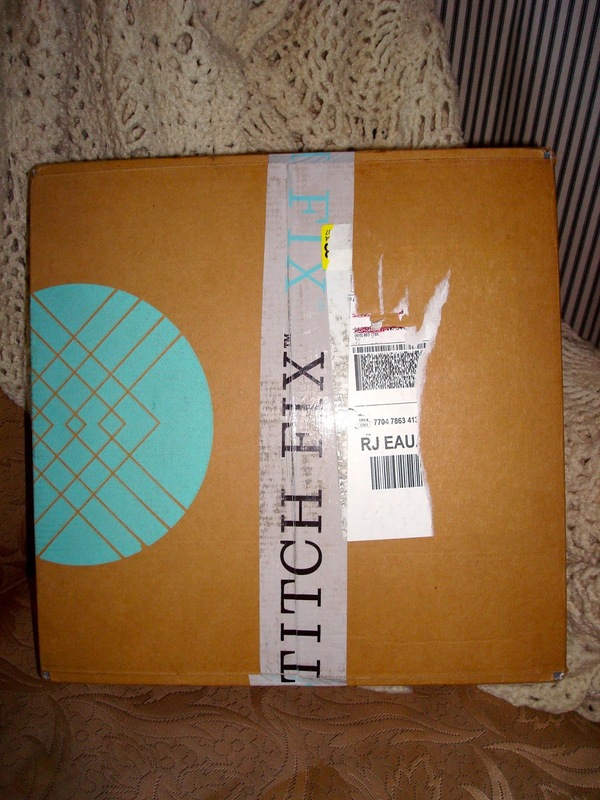 I've always been very pleased with Stitch Fix, but this fix was my favorite. I'm always so excited to see the box sitting on my porch when I get home from work. It's like a present just for me and I can't wait to see what's inside. 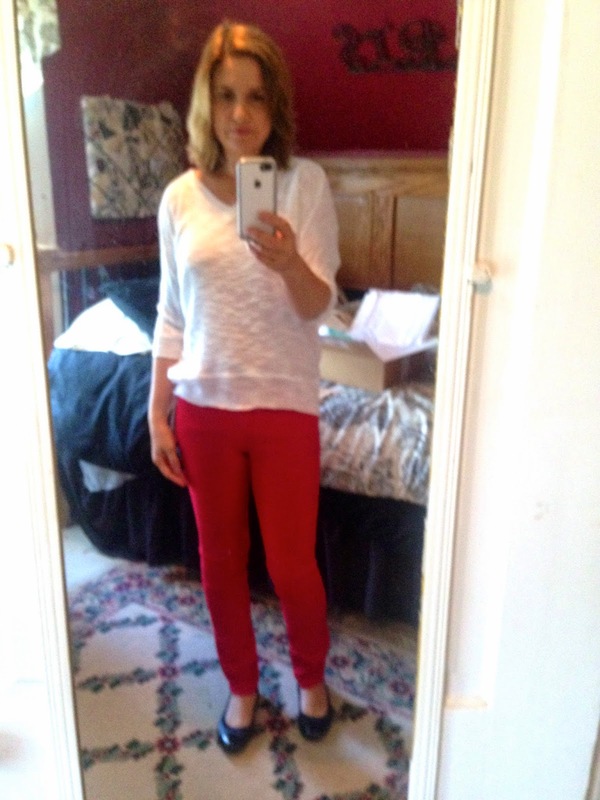 And when I opened the box, these were my goodies: a pair of red jeans! 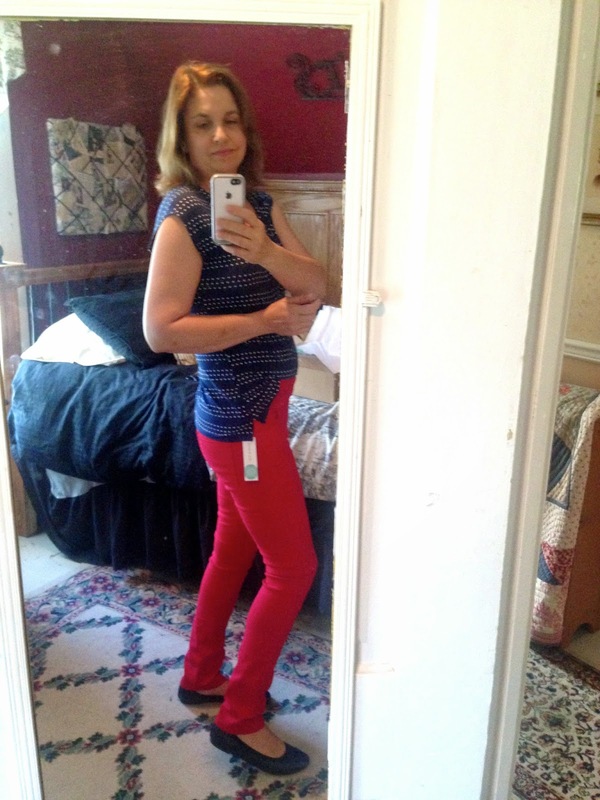 Now, I almost sent these jeans back because I already own a pair of red pants that you can see HERE. 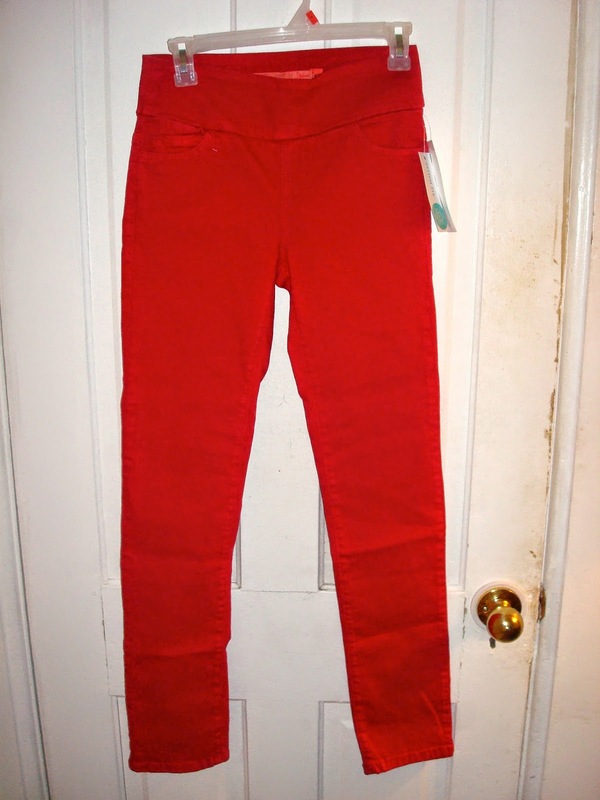 However, those pants are a knit material, have a completely different cut, and I think they are more suitable for warmer months, whereas these red pants are a heavy jean material and fit more like jeggings and would be more suitable for winter (especially with boots). Plus, as I learned in a previous FIX, you get 25% off your total order if you keep everything, and most of the time if you send only one item back, you lose money: so this time I kept the pants! I will show you all my new clothes more suitably styled in future Fashion Over Fifty posts, but for today's post I decided to just do selfies with no make up on or much styling, just so I can focus on the fix itself. 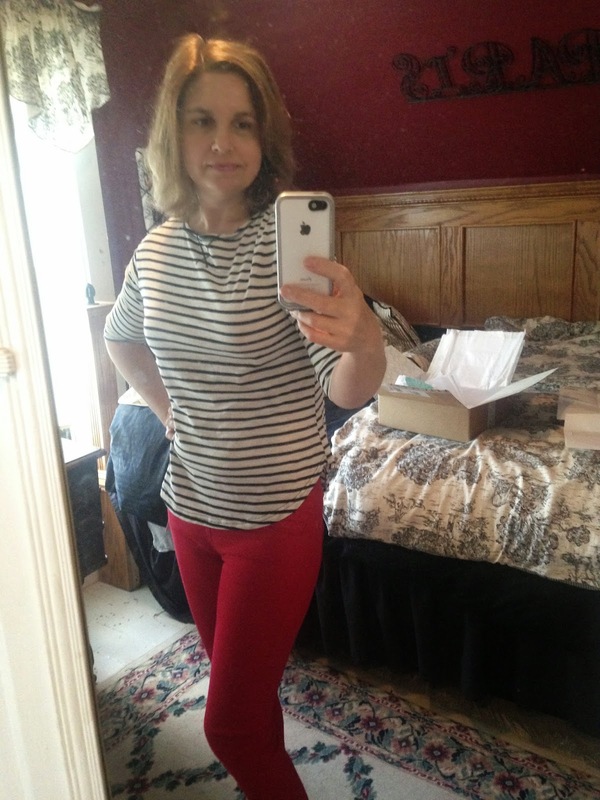 In the first selfie, I just threw on a shirt Stitch Fix gave me in my last fix: it went perfectly with this month's fix. I took this picture with my pants tucked in a bit so that you could see the waist band. There are no snaps, buckles, or zippers with these pants! 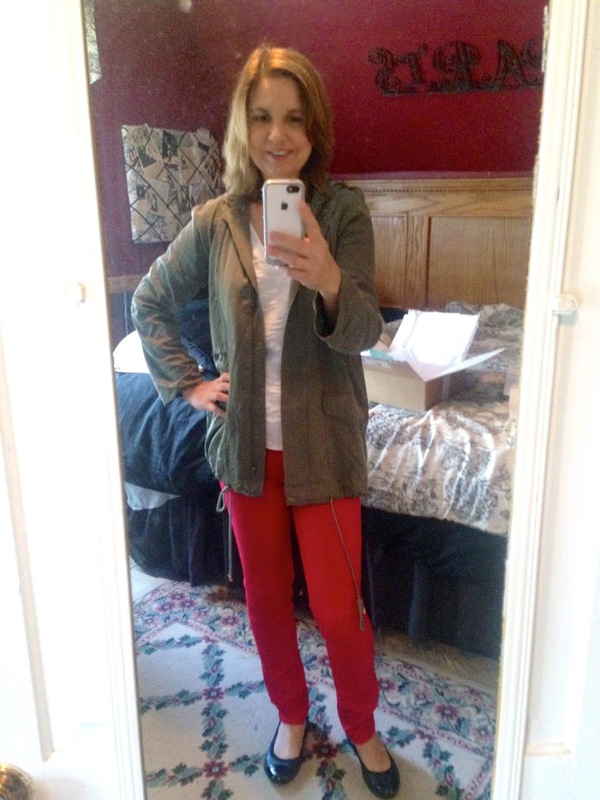 As always, Stitch Fix sends a style card with every item showing you various ways to wear the piece of clothing. The jeans are very tight and form fitting, so I would probably always wear a longer top or sweater with them. I could definitely see a long comfy white, beige, or tan sweater and a pair of high boots with these pants in the winter….couldn't you? 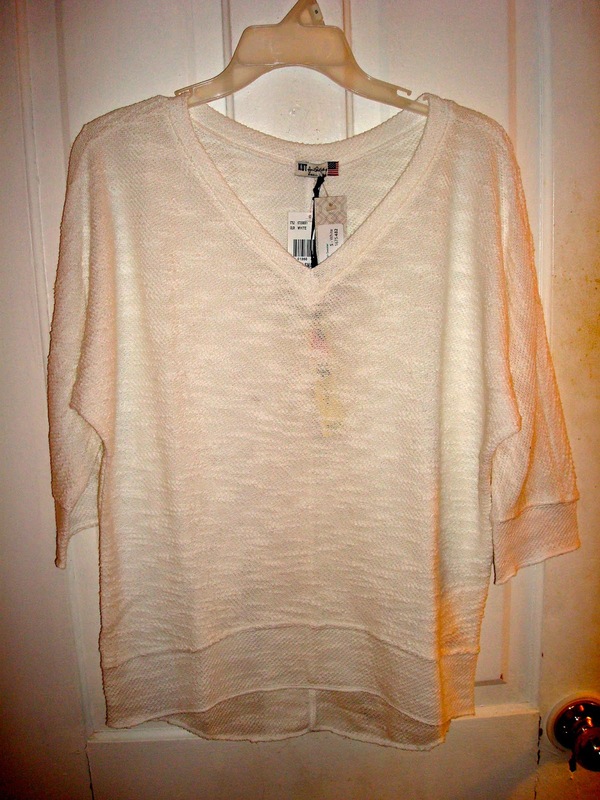 Speaking of white sweaters, this was the second item in my fix: a sheer, white knit sweater. I loved the texture, the band at the bottom, and the light weight material. It's perfect for chilly summer or spring nights, or those in-between season months when it's too hot for a real sweater, but too chilly for a t shirt. It is very sheer, so I would have to wear a tank underneath. I love how they have this top paired with a maxi skirt. I own one maxi dress, but I don't own any maxi skirts. I think I will have to get one now after seeing this style card! I think this coat was my favorite item in this fix. 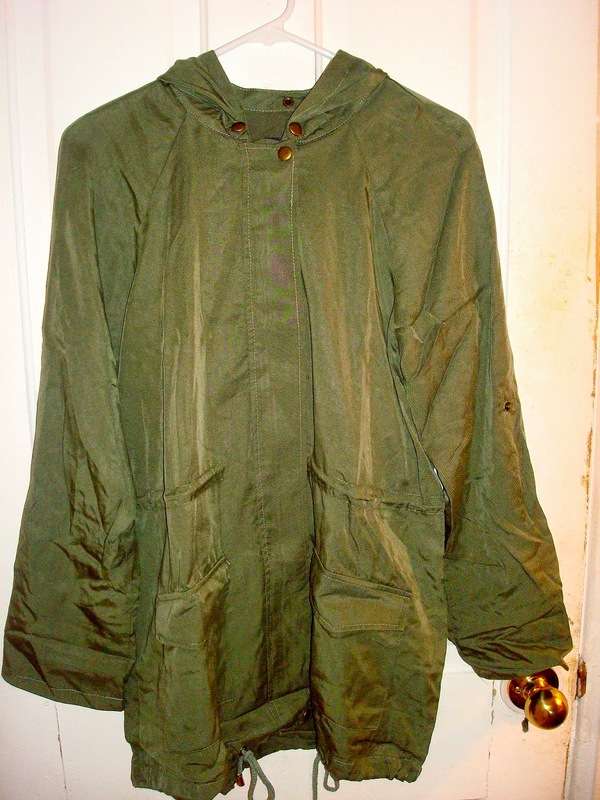 I already own a green jacket/blazer that you can see HERE, but that one is really small and has a completely different cut, whereas this one is over sized so I can wear it over a lot of things and wear it more like a real jacket and not just as a blazer. The material is so soft to touch, and there is a hood for rainy days. I love how they styled the jacket on the style card. They show it worn both casually and with a dress. I've seen lots of pictures on Pinterest where they wear army jackets like this with a pretty dress or skirt: I just love the contrast. 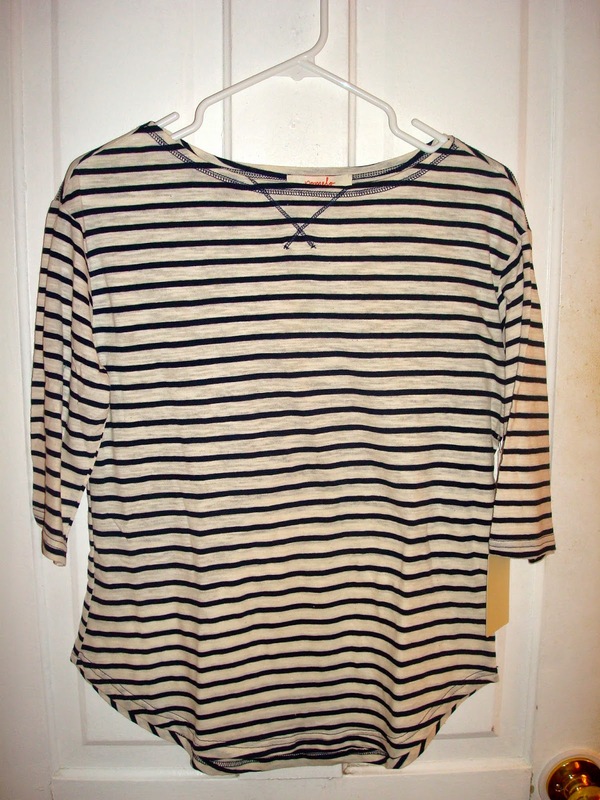 My next piece is a casual white and blue striped T shirt. I can't tell you how long I've wanted a shirt like this. I own a blue long sleeve shirt with white stripes that is made of a very clingy knit material and really shows every bump and bulge, so I hardly ever wear that one. And I have a white and blue striped knit hoodie, but I did not have a classic T like this till now. Score! I love the looser fit of this T and the little detail in the collar. These white and navy striped shirts have been everywhere the past few fashion seasons, and they go with just about everything. You can wear them with jeans for a casual look, white pants for a nautical look, or pair it with a pretty pencil floral skirt! In the style card below, they have the shirt paired casually with jeans, and dressed it up a bit with accessories. 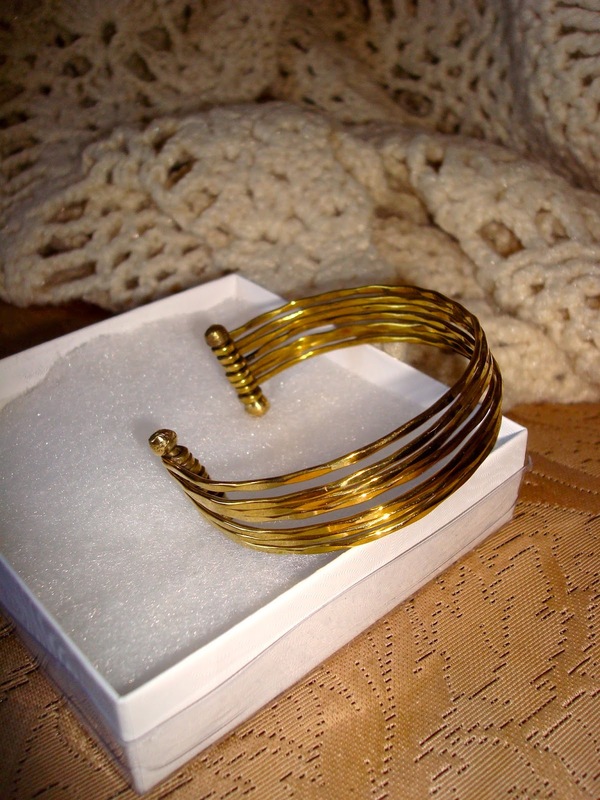 And the final item in my fix is this gold bracelet. It is many different rings of gold adhered together at one point. LOVE! Yes, Stitch Fix ROCKED this fix. One thing I did different was that I added a Pinterest board link to my Stitch Fix profile so that my stylist could see my taste. I have a lot of pictures of red pants and green cargo jackets on my board, so I could tell she was looking! The only drawback to using a Pinterest board, was that I usually PIN items already have, but I can't figure out how to style, and I think my stylist thought I didn't have those items, but I wanted them. 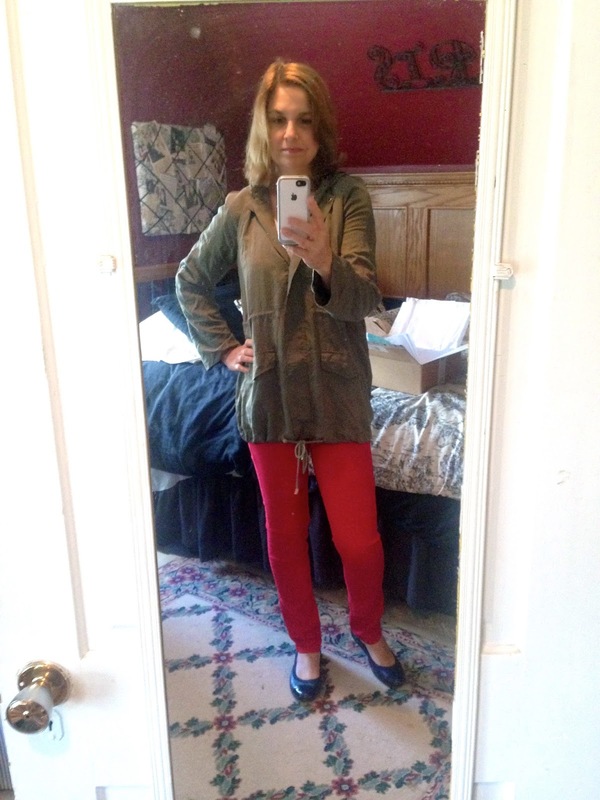 In the end, it didn't matter though, because the cuts and styles of the two similar items I already own, are very different than the ones I received, and I think I like Stitch Fix's versions better: especially the jacket. I was so happy with this fix, that I am considering NEVER shopping on my own anymore and just letting Stitch Fix do it for me. I love to shop, but I always feel I just end up with a lot of items that I have nothing to wear with or I don't know how to wear, so they end up just hanging in my closet with the price tags still on them. Such a waste. Plus, in the area where I live, it's really hard to find stylish clothes. 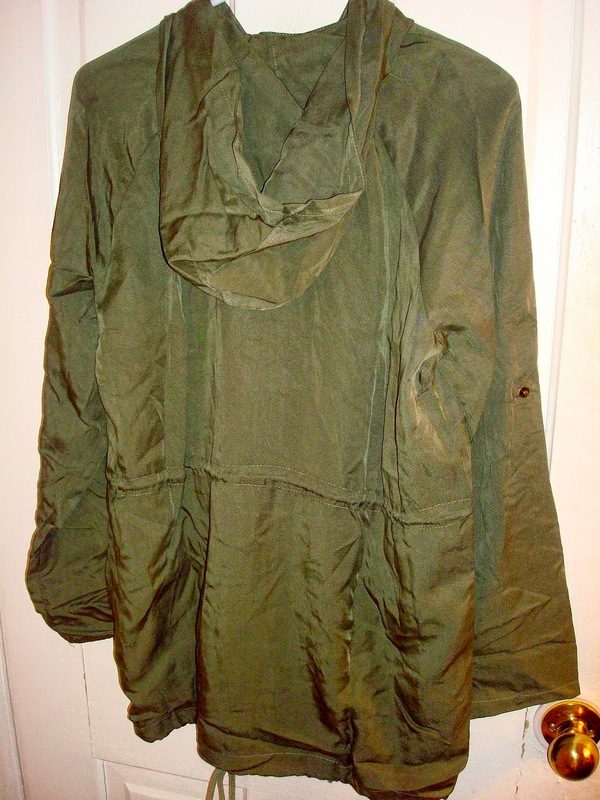 I've wanted an anorak jacket like the one Stitch Fix sent me forever, but I couldn't find one so I bought a similar green jacket, but it wasn't quite what I was looking for. I think if I do decide not to shop anymore, it will be hard. Were trained to buy what the eye sees, or go shopping as a social activity. It will be a hard habit to break, but in the end, I think I'll save money and I won't have so much waste. I don't know, what do you think? Oh, by the way, did you notice everything in my fix went together? That's never happened before. 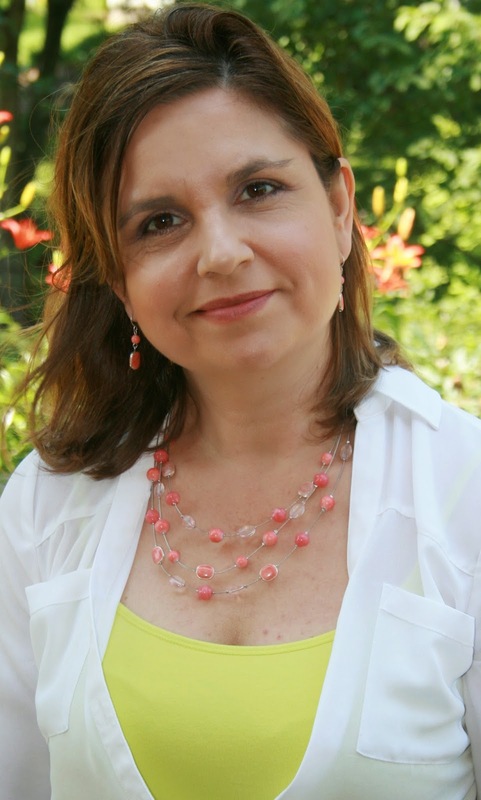 Fashion Over Fifty: Say it isn't So!